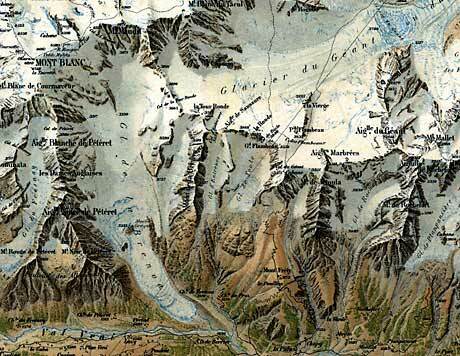 Xaver Imfeld (1853–1909) was the most important Swiss panorama illustrator, relief artist, cartographer, and planner of mountain railways of his time. 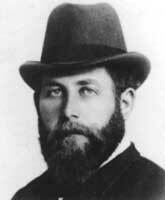 From 1876 to 1890 he worked at the Swiss Federal Bureau of Topography (today called swisstopo). Next to his occupation as engineer-topographer he built thirteen gypsum alp reliefs. His maps became famous for their vivid terrain visualisation and their rock drawings. One of his masterpieces is the relief map “La Chaine du Mont Blanc” (the Mont Blanc chain), the other one is the plan oblique map “Reliefkarte der Centralschweiz”. “La Chaine du Mont Blanc” (detail) by Xaver Imfeld, original scale 1:50,000, 1896.